You begin your tour with a wonderful drive along the scenic coastal road which affords a splendid view of the Saronic Gulf, passing through some of the most beautiful suburbs of Athens (Glyfada, Vouliagmeni, Varkiza). Once there you will visit the 5th century B.C. Temple of Poseidon with one of the most breathtaking panoramic views in the world (on a clear day you can see at least seven islands!). The precipice is a sheer 197 foot drop to the sea. 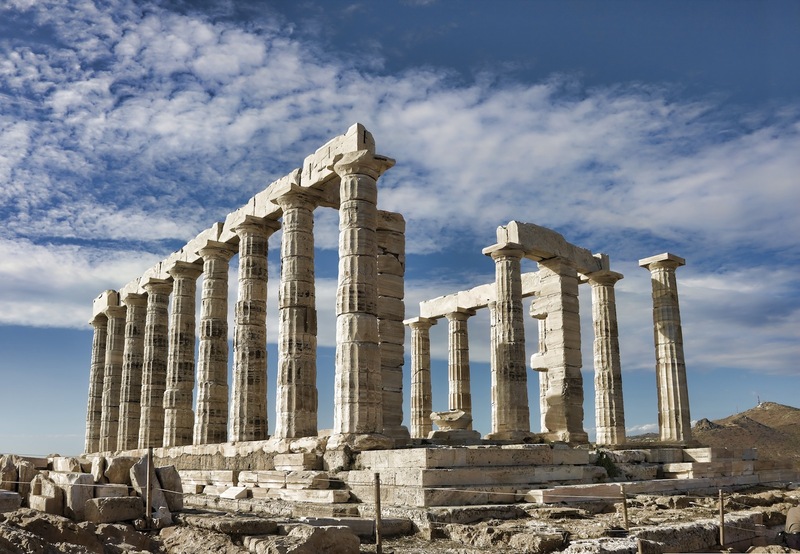 Sounion is a wonderful choice for a half day trip from Athens, and is a world famous spot at sunset. You will have the services of a licensed guide with you who will provide background information of the places you will see along the way. After your visit to the temple you will have time to take your pictures and stop for coffee or refreshments by the site. There is a pick-up service provided from most centrally located hotels.The pick up from the hotels, takes place up to 70 min in advance, depending on the location of each hotel. If you require a pick-up service please advise us in the comments section of your reservation and you will receive directions and pick up time by email. The entrance tickets are included in the price. The bus leaves the terminal at the activity departure time. For your convenience, there is a pick-up service provided from most centrally located hotels. The pick-up from the hotels, takes place up to 70 min in advance, depending on the location of each hotel. If you decide to make your own way to the coach terminal you should be there approximately 15 minutes before the indicated time of departure. CALL US for directions to the coach terminal at +306945859662. The tour do not take place on the public Holidays: 25 & 26 December, New Year's Day, Good Friday (before 12:00), Easter Day, May 1st and March 25, the Greek Independence Day. * Please note: From Oct 1st to Mar 31st the departure time is 2:30 pm. Ask us for the pick-up time from or near your hotel.